“You’re The Best Thing About Me” (U2 vs. Kygo) will only be available on formats that include the Deluxe CD. The other three tracks will be available on vinyl. “The Blackout (Jacknife Lee Remix)” will be a bonus track on the deluxe edition of the CD in Japan. The album Songs of Experience is the studio album released by U2 in 2017. The title is taken from the work of William Blake, Songs of Innocence and of Experience, in the late 1700s, and the album is a follow up to U2’s own album Songs of Innocence, released in 2014, and it is U2’s fourteenth studio album. The album was started in earnest during rehearsals for 2015’s “Innocence and Experience” tour, as the band worked with Joylon Thomas as rehearsals commenced in Vancouver for that tour. Recording continued and the band worked with producers Jacknife Lee, Andy Barlow, and Steve Lillywhite to finish the album. Songs of Innocence had barely hit iPhones, and Bono was already announcing the next album, Songs of Experience, in a letter to U2.Com titled “Remember Us?” he stated, “We’re collaborating with Apple on some cool stuff over the next couple of years, innovations that will transform the way music is listened to and viewed. We’ll keep you posted. If you like Songs of Innocence, stay with us for Songs of Experience. It should be ready soon enough… although I know I’ve said that before…” But the album was far less ready than Bono lead readers to believe. The Edge interviewed in May 2015, suggested that the album might be ready before the end of the year. By November of that year The Edge had suggested the album would be completed in early 2016, and released by the end of the year. In the summer of 2016, plans had been made to release the album on October 31, 2016. The first single, “You’re The Best Thing About Me” was to be delivered to radio September 23, 2016, the same day that the band were due to play the iHeart Festival in Las Vegas. Additional promotional stops had been planned including the Salesforce meeting in early October which did happen, and a number of rumoured appearances that would later not happen including an appearance by Bono with Kygo in California, an appearance in Dublin to mark the bands 40th birthday, and an appearance on the Jools Holland Show. However in late-August, word was delivered to the record company that the album would be postponed. The band claimed the reason for the delay was the shift in global politics to a more conservative nature with the popularity of Donald Trump, and the recent Brexit vote. The band decided to step back and hold the album to reflect on this, but along the way one collaborator, Kygo, was not notified. Kygo had remixed the first single, “You’re the Best Thing About Me” and debuted the single live at a festival appearance in Norway on August 19, 2016. It seemed that U2 were about to embark on a new album campaign, but that never happened, and news that the band had once again decided to delay the album circulated. At Christmastime, the band announced that they would embark on a tour to celebrate the thirtieth birthday of The Joshua Tree, and that Songs of Experience would be out before the end of 2017. A number of songs made live debuts on The Joshua Tree 2017 tour. “The Little Things That Give You Away” debuted on opening night of that tour, and was played a number of times on the first and second leg of that tour, including a performance on Jimmy Kimmel Live. At the end of the night, when the song has been performed, U2 has displayed an Anton Corbijn photograph on the screen of Bono’s son Eli, and Edge’s daughter Sian holding hands, which many have theorized will be the album cover. “The Blackout” debuted on July 28, 2017 while the band were appearing in Amsterdam, but not at the tour. Instead, fans were invited to a taping of the video, in which the song was played five separate times while the band and audience were filmed. Finally “You’re the Best Thing About Me” has debuted at a performance at The Tonight Show with Jimmy Fallon on September 7, 2017 the day after it was released as a single. It made its debut on the tour on September 10, 2017 in Indianapolis, Indiana. On August 29, 2017, U2 announced that “You’re The Best Thing About Me“ would be the first single from the album. At the same time they announced “The Blackout“ would be released as a streaming only video prior to the release of the single. “The Blackout“ was released as a Facebook streaming video on August 30, 2017. “You’re The Best Thing About Me“ was released as a single on September 6, 2017. A remix version of the song, as well as an acoustic version of the song were released later the same month, as well as a number of videos. On October 26, 2017, it was announced that a single for “The Blackout“ would be released on Record Store Day’s Black Friday event, November 24, 2017. The announcement of the album came on November 1, 2017, after a number of information leaks. The album will be released December 1, 2017. 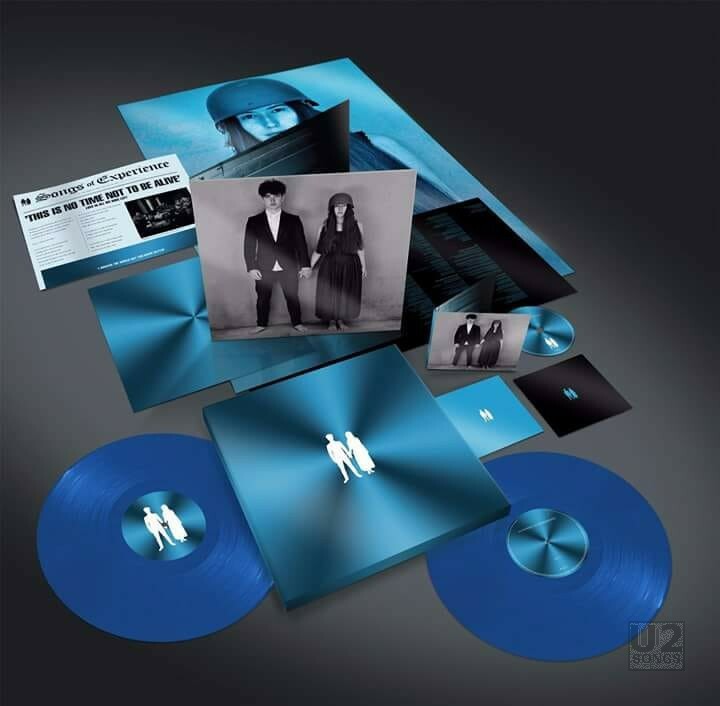 Four formats have been announced for physical editions, a regular CD, a deluxe CD, a regular 12-inch vinyl pressed on two blue discs, and a box set which will contain the deluxe CD and the 12-inch vinyl sets along with additional materials such as a poster and newspaper. In Japan, there will be a bonus track included on the deluxe CD set, and that song will be “The Blackout (Jacknife Lee Remix)”. The regular album will consist of 13 tracks, and the vinyl will include one additional song, as well as two remixes. The deluxe CD will contain the same bonus materials as the vinyl, but will add an additional remix. Also on November 1, 2017, two songs were made available for immediate download and could be purchased separate or as part of the album. “Get Out of Your Own Way” and “The Blackout” were both made available in this manner. “The Blackout“ will also be released as a limited 12-inch record on November 24, 2017. A third song, was also released by mistake on November 1. When purchasing a physical copy of the deluxe album from U2.Com subscribers could download “Get Out of Your Own Way” and “The Blackout” but early subscribers found they also had a copy of “American Soul” available to them. This mistake was quickly identified and within hours that song was no longer available. “American Soul” was finally made available across all platforms on November 17, 2017. The album leaked on the internet on Friday, November 24, as a Facebook user live streamed himself playing the album multiple times. The low quality leak was the first version, but days later, on November 26, 2017, a rip from a digital source also leaked. In 2018 an additional version of the album was announced and released on SHM-CD in Japan. This release was initially announced for December 5, but the disc was actually released on December 12. All of U2’s other albums had previously been released in this format in September 2017. Produced by Jacknife Lee and Ryan Tedder with Steve Lillywhite, Andy Barlow, Jolyon Thomas, Brent Kutzle, Paul Epworth, Danger Mouse and Declan Gaffney. Engineered by Matt Bishop, Rich Rich, Tyler Spry, Drew Bang, Matty Green, Jacknife Lee, Andy Barlow, Declan Gaffney, Brandon Bost. Additional Engineering by: Doug Sarret, Richard Rainey, Greg Clooney, Matt Wiggins, Grant Ransom, Christopher Henry. Assisted by Alex Bailey, Barry McCready, Dave “Squirrel” Covell, Aleks Von Korff, Gosha Usov, Alan Kelly, Adam Durbridge, “Classy” Joe Visciano. Mixed by Tom Elmhirst, Jacknife Lee, Steve Lillywhite, Kelana, Andy Barlow, Matty Green, Bryan Cook, Will Kennedy, Miles Walker. Assisted by Brandon Bost, Matt Bishop, Alex Bailey, Ryan Jumper, Ben Baptie. Technical Manager & Session Coordinator: Rab McAllister. Studio Manager / Drum Tech: Sam O’Sullivan. Guitar Tech: Dallas Schoo. Guitar and Keyboard Tech, Engineer: Duncan Stewart. Mastering: Scott Sedillo at Bernie Grundman Mastering. Recorded at Electric Lady Studios, The Garage at Topanga, Shangri-La, Strathmore House, Neptune Valley, Hanover Quay, Windmill Lane Studios, The Woodshed, Uno Mas Studio, Waterloo Studio, The Church Studios. All tracks written by U2 except “Lights of Home”, “Lights of Home (St Peter’s String Version)” written by U2, Alana Haim, Danielle Haime, Este Haim and Ariel Rechshaid, “Ordinary Love (Extraordinary Mix)” written by U2 and Brian Burton. To our roving Executive Producer Jimmy Iovine. To ears beyond years, Chris Martin & ears beyond beers, Noel Gallagher. This album is dedicated to the lives and times of Dennis Sheehan, Jack Heaslip and the teenage dreams of David Bowie. Love is All We Have Left: Music by U2. Lyrics by Bono. Produced by Andy Barlow. Engineered by Andy Barlow. Mixed by Andy Barlow at The Lookout Studios. Assisted by Alex Bailey. Additional keyboards, programming, and sound design by Andy Barlow. Additional credit to Dawn Kenny. Lights of Home: Music by U2, Alana Haim, Danielle Haim, Este Haim and Ariel Rechtshaid. Lyrics by Bono. Produced by Jacknife Lee with Ryan Tedder and Brent Kutzle. Additional production by Jolyon Thomas. Engineered by Matt Bishop and Tyler Spry. Additional engineering by Drew Bang. Assisted by Dave “Squirrel” Covell and Barry McCready. Mixed by Jacknife Lee. Assisted by Matt Bishop. Additional backing vocals by Haim. Additional keyboards, additional guitars and programming by Jacknife Lee. You’re The Best Thing About Me: Music by U2. Lyrics by Bono. Produced by Jacknife Lee with Ryan Tedder, Steve Lillywhite and Brent Kutzle. Engineered by Rich Rich, Jacknife Lee, Tyler Spry, Matt Bishop and Matty Green. Assisted by Barry McCready. Additional engineering by Christopher Henry, Richard Rainey and Greg Clooney. Assisted by Gosha Usov and Alan Kelly. Mixed by Steve Lillywhite and Kelana at Lillyput Studios. Additional mixing by Tom Elmhirst. Assisted by Brandon Bost. Programming by Ryan Tedder and Jacknife Lee. Additional programming by Brent Kutzle. Additional keyboards by Jacknife Lee. Strings by Davide Rossi. Get Out Of Your Own Way: Music by U2. Lyrics by Bono. Produced by Ryan Tedder with Steve Lillywhite, Brent Kutzle and Jolylon Thomas. Additional production by Jacknife Lee. Outro by Kendrick Lamar. Engineered by Rich Rich, Tyler Spry and Matty Green. Assisted by Christopher Henry and Gosha Usov. Additional engineering by Drew Bang, Matt Bishop and Declan Gaffney. Mixed by Tom Elmhirst. Assisted by Brandon Bost. Additional keyboards by Brent Kutzle and Gosha Usove. Additional guitar and keyboards by Jolyon Thomas. Additional backing vocals by Ryan Tedder. American Soul: Music by U2. Lyrics by Bono. Produced by Jacknife Lee. Additional production by Jolyon Thomas and Declan Gaffney. Introduction by Kendrick Lamar. Engineered by Matt Bishop. Assisted by Barry McCready. Additional Engineering by Drew Bang. Assisted by Dave “Squirrel” Covell. Mixed by Jacknife Lee. Assisted by Matt Bishop. Programming by Jacknife Lee. Additional keyboards and guitars by Jacknife Lee. Summer of Love: Music by U2. Lyrics by Bono. Produced by Ryan Tedder with Brent Kutzle. Additional production by Jacknife Lee. Engineered by Rich Rich, Tyler Spry, Matt Bishop and Brandon Bost. Additional engineering by Christopher Henry and Doug Sarrett. Mixed by Tom Elmhirst. Assisted by Brandon Bost. String arrangement by Brandon Collins. Violins by Amy Helman and Avery Bright. Viola by Betsy Lamb. Cello by Paul Nelson. Programming by Ryan Tedder and Brent Kutzle. Additional programming by Noel Zancanella. Keyboards by Ryan Tedder, Brent Kutzle and Jacknife Lee. Additional percussion by Nate Lotz. Additional guitar by Brent Kutzle. Background vocals by Lady Gaga. Additional backing vocals by Ryan Tedder. Red Flag Day: Music by U2. Lyrics by Bono. Produced by Ryan Tedder with Steve Lillywhite, Brent Kutzle and Andy Barlow. Engineered by Rich Rich, Tyler Spry, Matty Green and Declan Gaffney. Additional engineering by Christopher Henry. Assisted by Aleks Von Korff, Gosha Usov and Alex Bailey. Mixed by Tom Elmhirst. Additional Mixing by Declan Gaffney. Assisted by Brandon Bost. Additional programming by Ryan Tedder and Brent Kutzle. Additional acoustic guitar by Brent Kutzle. Additional percussion by Steve Wilmot. Additional keyboards by Declan Gaffney. Additional background vocals by Ryan Tedder and Julian Lennon. The Showman (Little More Better): Music by U2. Lyrics by Bono. Produced by Ryan Tedder with Steve Lillywhite. Additional production Jacknife Lee. Engineered by Matty Green, Rich Rich and Matt Bishop. Assisted by Aleks Von Korff, Christopher Henry and Gosha Usov. Mixed by Steve Lillywhite. Assisted by Matty Green. Additional guitar by Ryan Tedder. Additional backing vocals by Ryan Tedder. The Little Things That Give You Away: Music by U2. Lyrics by Bono. Produced by Jolyon Thomas. Additional production by Andy Barlow. Engineered by Drew Bang and Brandon Bost. Assisted by Dave “Squirrel” Covell and Alex Bailey. Mixed by Tom Elmhirst. Assisted by Brandon Bost. Additional keyboards by Andy Barlow. Additional guitar and keyboards by Jolyon Thomas. Landlady: Music by U2. Lyrics by Bono. Produced by Jacknife Lee. Original production by Ryan Tedder. Additional production by Andy Barlow. Engineered by Matt Bishop. Assisted by Aleks Von Korff, Dave “Squirrel” Covell and Barry McCready. Additional engineering by Declan Gaffney. Mixed by Tom Elmhirst. Assisted by Brandon Bost. Additional guitar by Jacknife Lee. Strings by Davide Rossi. The Blackout: Music by U2. Lyrics by Bono. Produced by Jacknife Lee. Original production by Ryan Tedder. Additional production by Brent Kutzle. Engineered by Matt Bishop, Rich Rich, Tyler Spry and Declan Gaffney. Assisted by Christoper Henry, Barry McCready and Dave “Squirrel” Covell. Mixed by Jacknife Lee. Assisted by Matt Bishop. Programming by Jacknife Lee. Additional keyboards and guitars by Jacknife Lee. Love is Bigger Than Anything in Its Way: Music by U2. Lyrics by Bono. Produced by Jacknife Lee. Engineered by Matt Bishop. Assisted by Barry McCready and Dave “Squirrel” Covell. Mixed by Jacknife Lee. Assisted by Matt Bishop. Additional keyboards by Jacknife Lee and Andrew Taggart (The Chainsmokers). Additional guitars by Jacknife Lee. Additional backing vocals by Jacknife Lee. 13 (There is A Light): Music by U2. Lyrics by Bono. Produced by Ryan Tedder with Paul Epworth. Engineered by Rich Rich, Matt Wiggins and Brandon Bost. Additional Engineering by Declan Gaffney. Mixed by Tom Elmhirst. Assisted by Brandon Bost. Programming by Paul Epworth. Additional keyboards by Paul Epworth. Ordinary Love (Extraordinary Mix): Music by U2 & Brian Burton. Lyrics by Bono. Produced by Danger Mouse with Paul Epworth. Additional production by Declan Gaffney. Engineered by Declan Gaffney and Matt Wiggins. Assisted by Adam Durbridge and “Classy” Joe Visciano. Additional engineering by Matty Green and Grant Ransom. Mixed by Tom Elmhirst and Mtty Green. Assisted by Brandon Bost and Ben Baptie. Programming by Paul Epworth. Additional keyboards by Barry Gorey. Additional piano and mellotron by Declan Gaffney. Additional backing vocals by Angel Deradoorian and Joseph Elmhirst. Book of Your Heart: Music by U2. Lyrics by Bono. Produced by Andy Barlow. Engineered by Andy Barlow. Additional enginerring by Declan Gaffney. Assisted by Alex Bailey. Mixed by Andy Barlow at The Lookout Studios. Programming by Andy Barlow. Additional backing vocals and keyboards by Andy Barlow. Lights of Home (St Peter’s String Version): Music by U2, Alana Haim, Danielle Haim, Este Haim and Ariel Rechtshaid. Lyrics by Bono. Produced by Jacknife Lee with Ryan Tedder and Brent Kutzle. Additional production by Jolyon Thomas. Engineered by Rich Rich and Tyler Spry. Assisted by Christopher Henry. Additional engineering by Doug Sarrett and Drew Bang. Mixed by Bryan Cook and Will Kennedy. Mastered by Hans Dekline. String arrangement by Brandon Collins. Violins by Amy Helman and Avery Bright. Viola by Betsy Lamb. Cello by Paul Nelson. Keyboards by Brent Kutzle. Pedal steel by Tyler Spry. Additional percussion by Nate Lotz. You’re The Best Thing About Me (U2 Vs Kygo): Music by U2. Lyrics by Bono. Produced by Jacknife Lee. remix and additional production by Kygo. Engineered by Matt Bishop. Assisted by Dave “Squirrel” Coverll. Mixed by Miles Walker at Silent Sound Studios. Assisted by Ryan Jumper. Programming by Jacknife Lee. Keyboards by Jacknife Lee. Design by Shaugn McGrath, Amp Visual, Dublin.